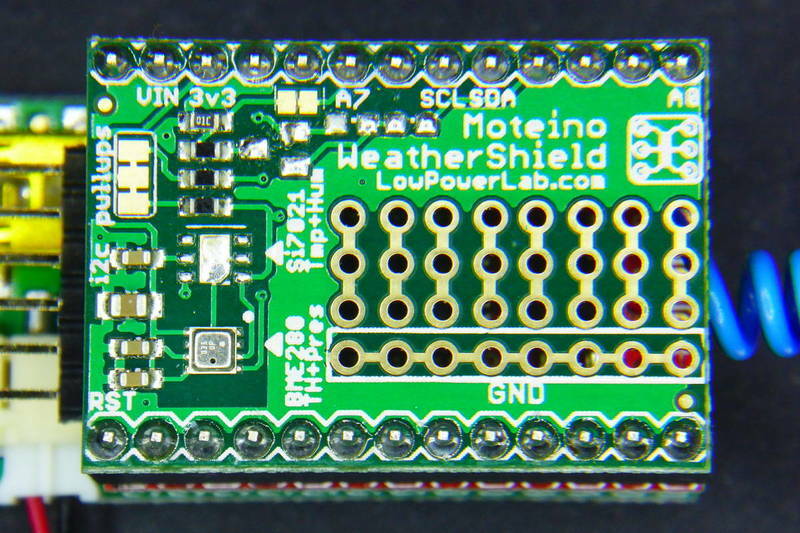 The Moteino WeatherShield R2 uses the new Bosch BME280 sensor, the heir of the BMP085, BMP180 and BMP183 dynasty. It provides temperature, humidity and pressure measurement in a very small package, with improved accuracy and really fast acquisition times. It’s that tiny silver square on the bottom left of the picture above. But, if the sensor is so small: what do you need the rest of the shield for? 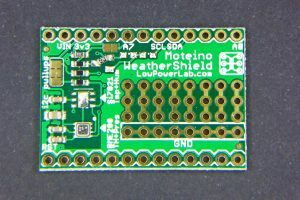 Well, you basically have a solder jumper for the on-board pull-ups for the I2C buses (they are connected by default), a voltage divider to monitor battery status on pin A7 (also with a solder jumper connected by default) and a SI7021 footprint as a cheaper alternative (USD 3-3.5 against the USD11 of the BME280 when bought in units). 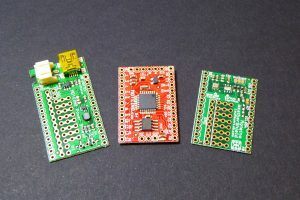 The rest of the board is a prototyping zone for your own addons. Code for this project is released as free open software and can be checked out at my Moteino Weather Station repository on Bitbucket. I like to start programming with a minimum working program and add features on top of it. So the first sketch I uploaded to the Moteino was just initializing the radio and sleep it immediately and then do the same with the controller using RocketScream LowPower library. I then grabbed my multimeter and the uCurrent Gold and checked the consumption: 1.9mA. What? I was expecting something around the 15uA. There was something wrong. Mind that I didn’t have anything plugged to the board yet. 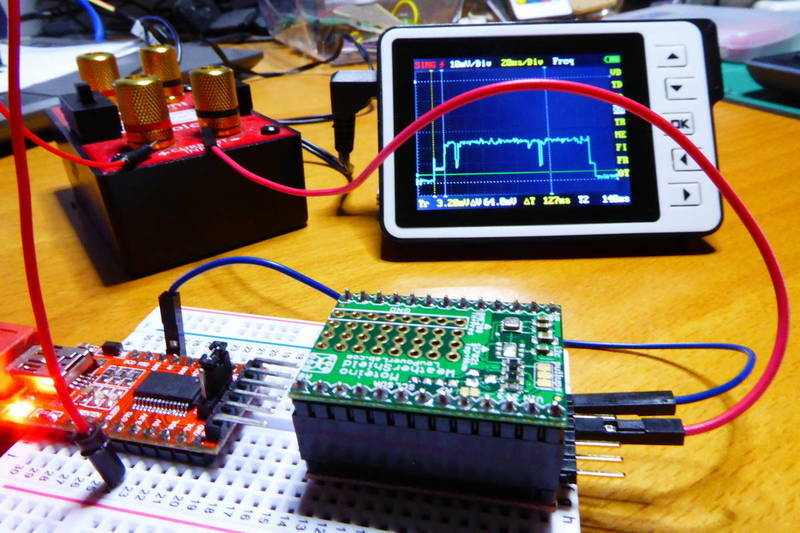 There was only the ATmega, the RFM69 radio and the SPI Flash IC… wait! Put the flash IC to sleep too!! And read my multimeter again: 14.3uA. Much better! 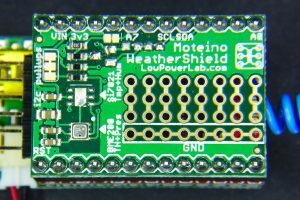 [ 901 ] BME280           arduino, atmelavr, atmelsam, espressif8266, intel_arc32, microchippic32, nordicnrf51, teensy, timsp430 "Tyler Glenn": Provides a library for reading and interpreting Bosch BME280 environmental sensor data over I2C. I had pretty good experiences with Adafruit’s libraries in the past so I installed it first. Loaded the sample sketch and it worked right away without modifications. Good. I then merged the sketch to my original one and checked power consumption again with controller, radio and flash in sleep mode: 714uA. Well, it’s not bad but I expected something better. The BME280 can work down to 100nA so there was room for improvement here. 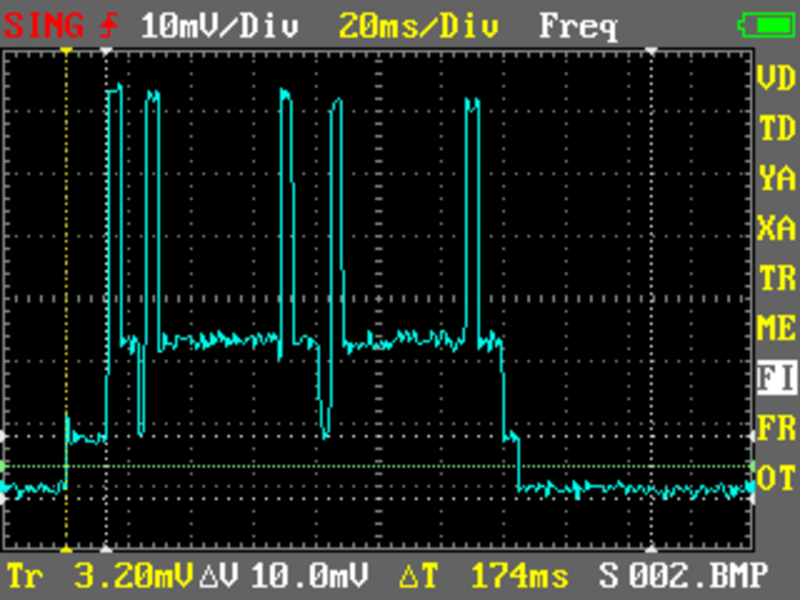 Reading the BME280 datasheet I found out that the sensor has 3 working modes: sleep, forced and normal. In “sleep” mode the sensor does not perform any measurements but the registers are available for reading. In “forced” mode the sensor is forced to perform one reading and then goes back to sleep. And in “normal” mode the sensor performs a reading and then stays in stand by for a certain amount of time before reading again. // We set the sensor in "forced mode" to force a reading. // After the reading the sensor will go back to sleep mode. So I just had to call my bmeForceRead method before reading the sensor registers. It sets the sensor in forced mode and waits for the readings to take effect. Timing is calculated based on BME280 datasheet. So back to the first section in this post I was talking about the missing mosfet and the voltage divider. 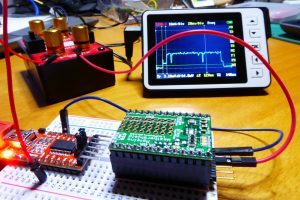 Do you know how much current flows through a 14k7 voltage divider at 3.3V? Around 224uA. Grabbed the solder iron and removed the 27Ohm resistor in the WeatherShield (the angled one). And since I was not going to use the battery monitor circuit in the shield I cut the solder jumper left to the A7 silkscreen label. And now…. 13.9uA!! Bingo! Mind that I’m close to the uCurrent error level so 2-3 uA up or down don’t really mean anything. Next I plugged my DSO Nano as I had done with the Door Monitor and captured some screenshots with sending power patterns. A sample capture. There is a delay at the beginning when the sensor is reading. Then you can see 3 packets, the second and third ones with a repeat 40ms after the first try. Last I added the Moteino PowerShield R3 and a small LiPo I had around. The Moteino Sandwich is ready. I also took some measurements with the whole set in sleep mode and it threw 12.2uA. Amazing. I expected a higher value due to the powershield boosting the ~4V of the LiPo to 5V to power the Moteino throught the VIN pin but I guess error in the measures is even higher than that. Low power weather station with BME280 and Moteino by Tinkerman is licensed under a Creative Commons Attribution-ShareAlike 4.0 International License. 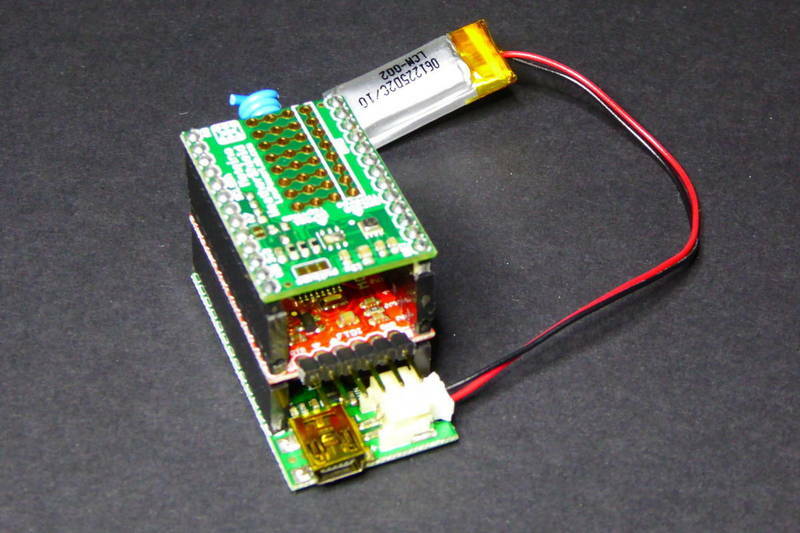 I work on similar project with BME280 and memory display powered by solar cell and super-capacitors. I use forced mode too, but only ONE in initialization. Now I see, why I have same data on LCD every time. I did not read the datasheet before in detail. Thanks for forceRead function explaination. Wow, I’m interested in your project, is it public somewhere? 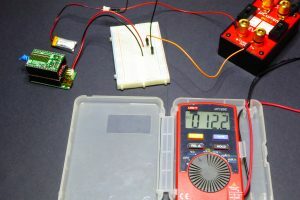 Actually not now, but connection is simply: small solar cell (6-9V) and low drop 5V LDO to charge 2 small and parallel 4,7F/2,5V capacitor. 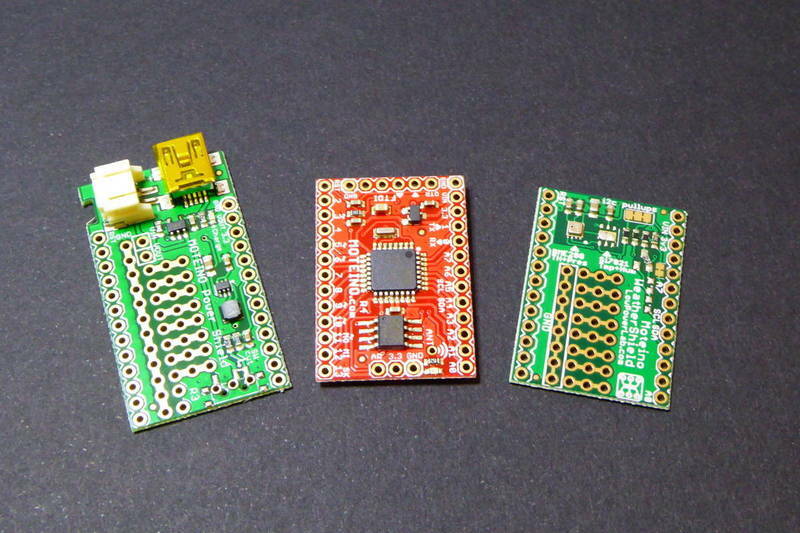 Than 3V3 low drop LDO to power arduino mini (without internal LDO and power led), SHARP memory display and BME280. Every minute processor measure data and write to LCD and going to sleep. Power consumption in power sleep is les than 10uA. Now actualy works some months without problems. Somtimes if was a week without more sunny days cappacitors lost power and dont work (winter time). If You want to see some pictire wtite mi a mail and I send You some =). Great, check your inbox, I’m interested. Thanks for sharing. 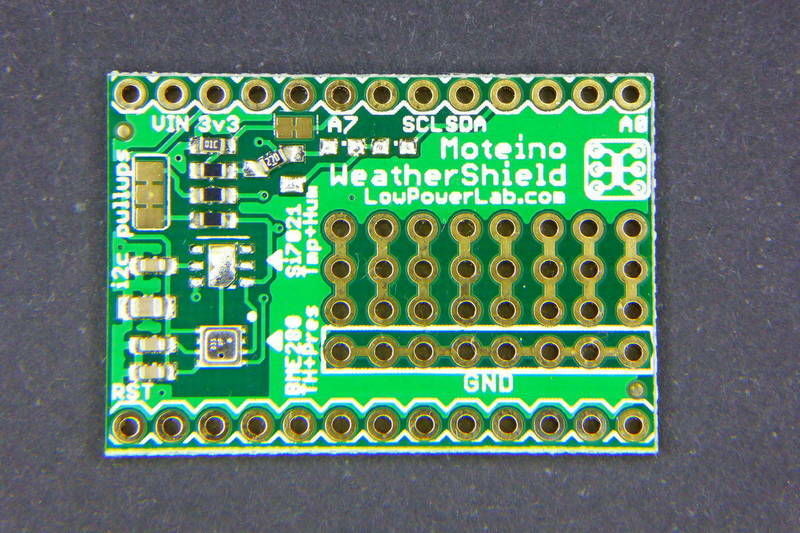 I am revamping my very old weather station to wireless transmit data to inside home and will base my project on this shield and your path. 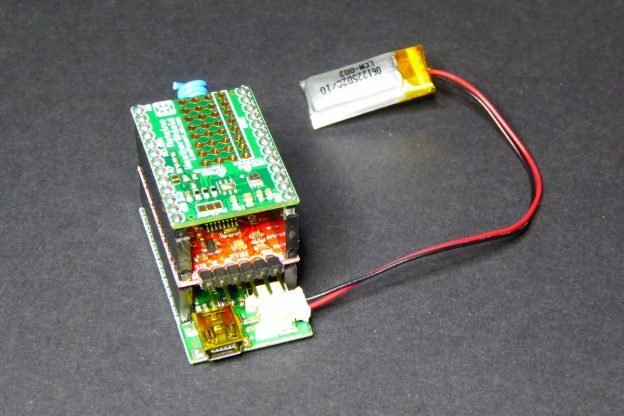 Why not use the power board’s ability to power off a AA, drop in a NiMH cell, and an appropriately sized solar panel with minimal components? Looking at https://learn.sparkfun.com/tutorials/sparkfun-bme280-breakout-hookup-guide it seems that the Sparkfun BME280 has a “runMode” setting in the constructor! So why did you need the “bmeForceRead” method? 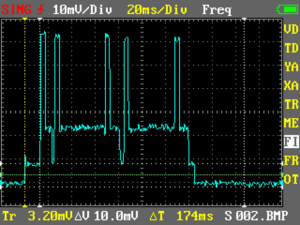 It has been a while… My understanding of how it works (according to the datasheet) is that once you perform a reading in Force Mode it returns to sleep mode, so if you want to do another reading you have to set the sensor in force mode again, that’s what my bcmForceRead method does.